511 Tactical 592450191SZ, 592451201SZ Field Ops Watch (59245) FREE SHIPPING! Available in three field-ready colors, the Field Ops Watch is built on a high-density polycarbonate frame and features 5.11's SureShot® ballistic calculator, a digital compass and traditional chronograph features. (Chrono includes three time zones, alarm, stopwatch, countdown timer and day/date displays.) The Field Ops also has a turnable bezel with directional markings and includes an optional extended band for wearing the watch over your gloves. Waterproof to 30M/100'. This was a gift for our son who was just sworn in as a police officer. He loves the watch and is amazed by all its functions. Thank you. 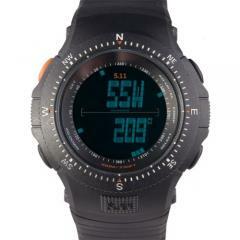 ©2002-2019 CopsPlus.com: 511 Tactical 592450191SZ, 592451201SZ Field Ops Watch (59245) FREE SHIPPING!